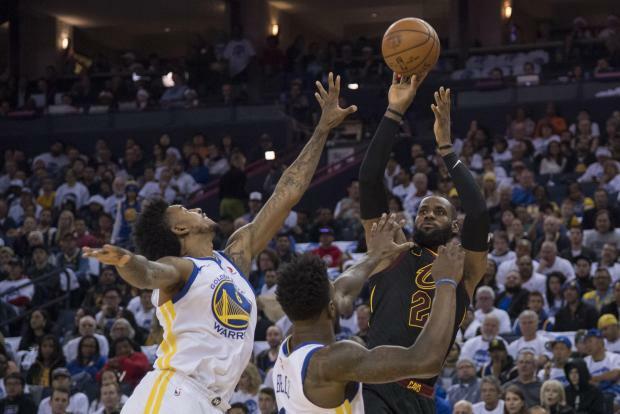 Klay Thompson broke a late tie with a 3-pointer and Kevin Durant protected the lead with two key defensive plays on LeBron James, lifting the Golden State Warriors to a 99-92 victory over the Cleveland Cavaliers in the NBA's marquee matchup on Christmas Day. Neither team led by more than nine points in the tightly contested rematch of last spring's NBAFinals, which the Warriors won in five games. Durant, despite just 8-for-19 shooting, had 25 points to pace the Warriors, who have won six of their last seven at home against the Cavaliers. Kevin Love had a game-high 31 points and 18 rebounds for the Cavaliers. James was held to 20 points on 7-for-18 shooting. Joel Embiid had 25 points and 16 rebounds, and J.J. Redick added 24 points with four 3-pointers as Philadelphia snapped its season-high five-game losing streak. Enes Kanter had 31 points -- including 14 in the third quarter -- and 22 rebounds, and Kristaps Porzingis added 22 points for the Knicks, who have lost three of four after winning four straight. Ben Simmons, who struggled offensively and finished with eight points, had a crucial steal and breakaway dunk with 1 minute, 6 seconds left, jumping in front of a Porzingis pass and taking it the other way to give the 76ers an eight-point cushion. He then forced a turnover on New York's next possession, and Philadelphia was able to juice the clock late. Kelly Oubre Jr. and Bradley Beal both scored five straight points during a late 12-0 run, leading Washington past Boston. It was the first time the Celtics played at home on Christmas, and they were fighting an uphill battle throughout the game. They wiped out an 11-point third-quarter deficit and led by five before the Wizards (19-15) caught fire. Beal scored 25 points and grabbed eight rebounds and John Wall had 21 points, 14 assists and five boards. Kyrie Irving and Jayson Tatum led the Celtics with 20 points apiece. Russell Westbrook scored 31 points to lift Oklahoma City over Houston. Westbrook outdueled James Harden, who finished with 29 points. Paul George added 24 and Carmelo Anthony 20 for the Thunder, who extended their season-long winning streak to five games. Trevor Ariza and Eric Gordon scored 20 for the Rockets, who lost for the third consecutive time after winning 14 consecutive games. Taj Gibson and Jimmy Butler scored 24 points apiece and Minnesota continued its best start in 14 years with a victory against Los Angeles. Karl-Anthony Towns had 21 points and 10 rebounds and Jamal Crawford contributed 19 points off the bench for the Timberwolves, who shot a season-high 58.3 percent from the floor. Kyle Kuzma made 6 of 11 3-pointers and scored 31 points to lead the Lakers. Jordan Clarkson added 17 points and Julius Randle scored 16 off the bench.